If you're tired of regular crosswords and fancy facing a new format, or simply a novice puzzler searching for the ultimate test, these fiendishly-fun games from the Daily Express are guaranteed to stretch your logic and word power. 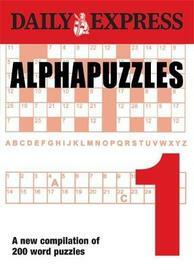 Alphapuzzles Volume 1 is a fantastic new compilation of 100 challenging grids that bring together the best bits of crosswords, word searches and code-breaking puzzles, along with additional time ratings, to create unique and demanding entertainment that will have even the most hardened linguaphile scratching their head for hours. And if you have trouble getting started, you can find two extra clue letters for each puzzle at the back of the book, making Alphapuzzles suitable for all abilities.